Global LNG markers dropped below $6/MMBtu over the last four weeks, with prices in major import regions closely aligned, limiting the potential for arbitrage between Atlantic and Pacific basins. Mild weather in north Asia and Europe has reduced heating demand, while new liquefaction projects continue to make progress, boosting supply. The East Asia Index (EAX) for April spot deliveries to Japan, China, South Korea and Taiwan slid from $6.30/MMBtu in mid-February to $5.40/MMBtu in mid-March. The monthly average of $5.994/MMBtu was down 18% from the previous month and 29% from the previous year. The EAX held around $0.500/MMBtu higher than the Northwest Europe Index (NEX), which averaged $5.470/MMBtu during the same period. Asian LNG prices tend to maintain a thin premium to Europe during times of healthy supply, to ensure cargoes from swing suppliers such as Qatar retain an incentive to deliver eastwards, as LNG is the sole source of gas supply for Japan. During periods of tighter supply, the Asian market can build a much bigger premium. Forward prices for Europe and Asia, including indications from the swaps market, show a thin premium of around $0.800/MMBtu remaining in place on the Asian gas market throughout the rest of 2019, but the premium was not particularly widening in the early winter months. This suggests the market expects a period of healthy supply, with northeast Asia not needing to offer a large premium to attract cargoes, and instead seeing prices largely tracking Europe’s NBP and TTF spot markets. 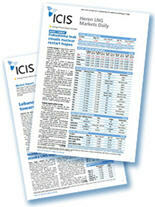 The South America Index (SAX) averaged $5.908/MMBtu across the last four weeks. Initially below the EAX, it later picked up slightly over the Asian marker, with buying interest beginning to pick up in the region as the southern hemisphere approaches its winter heating season, just as northern hemisphere importers like Japan and Europe move out of theirs. Global gas prices were increasingly competitive against oil. At the end of 2018, gas and oil briefly reached price parity at around $9/MMBtu, but since then oil has been on an uptrend, with gas steadily falling. Brent crude oil averaged around $11.478/MMBtu over the last four weeks, almost double of spot LNG levels. This differential could help prevent gas from falling much further as additional new supply comes into the market later in 2019. If gas can maintain a wide spread to oil, it could open up new demand markets, displacing the more expensive fuel, including in countries such as India. 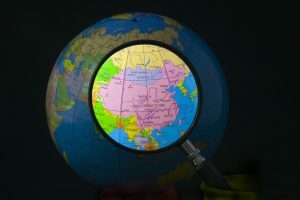 The key gas importers of northeast Asia, including China and Japan, have seen a mild winter, and traders have been talking of reduced appetite for new cargoes for some time, amid reports of continuing high stock levels at terminal tanks. In Europe traders had – at the start of the year – been anticipating a possible return of the ‘Beast from the East’, the severe cold snap that sent gas demand and spot gas prices spiking higher during late February/early March 2018. Early in 2019, a climate signal known as ‘sudden stratospheric warming’ indicated a similar system could appear in late winter 2019. However, late February actually saw abnormally high temperatures this year, which had an immediate impact on gas demand. Data from the UK National Grid shows that during the cold weather of 2018, the UK’s local distribution zone (LDZ) demand hit 350m cubic metres (mcm)/day. This is demand from users connected to local gas grids, mostly homes and businesses using gas for heating and cooking. That cold weather spike was some 100 mcm/day higher than earlier peaks last winter. During the first quarter of 2019, however, UK LDZ demand has remained below 300 mcm/day, and dropped to 150 mcm/day levels in late February, lower than at any point seen during the winter before. Demand from power generation has been relatively steady year on year, as has the level of demand from major industrial gas consumers, the National Grid data shows. Increased power generation from gas in regions that can optimise between gas and coal may help to absorb some of the new gas supply expected this year, although the UK data shows no signs of change yet. There have been some production outages in recent weeks, including at Nigerian, Australian and Qatari liquefaction plants. However, these have not been enough to reverse the downward trend in prices, due to the overall healthy supply position as new facilities come onstream. US producer Cheniere has now announced substantial completion of the first 4.5mtpa production train at its Corpus Christi plant in Texas, which has been producing initial test cargoes since late last year. The company’s fifth 4.5mtpa train at its Sabine Pass facility in Louisiana also looks to now be in full operation, after completing a shutdown during January and early February for final commissioning work. The 2.5mtpa Elba Island plant in Georgia, meanwhile, has received permission to start taking in feedgas supplies and should start producing LNG soon. Offshore Australia, though, there is still no news yet of a first cargo from Shell’s pioneering floating production vessel Prelude. On the demand side, Indian Oil received the first cargo, from Qatar, at its Ennore LNG import terminal on 26 February. This is the first LNG import facility on India’s east coast. A second cargo could follow in May, according to market sources. 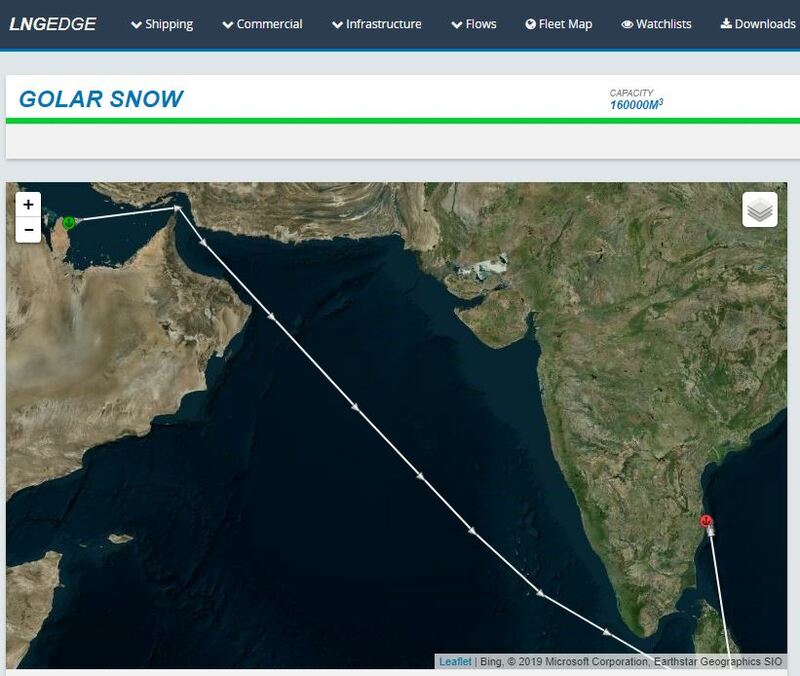 LNG Edge shows the 160,000cbm Golar Snow delivering the commissioning cargo from Qatar to India’s east coast Ennore terminal on 26 February. The Bahrain Spirit floating storage and regasification unit remains off the coast of Dubai. It is expected to take up position soon off Bahrain to act as an import facility for the Gulf state. Other new import projects are also expected to start up in coming months. The GDF Suez Cape Ann is expected to head to India’s port of Jaigarh to act as a new regasification point for the country, while Bangladesh is shortly expected to receive the Excelerate FSRU as its second regasification facility. Brazil, meanwhile, is to install the Golar Nanook FSRU to receive cargoes to fuel its new Sergipe power plant. These new demand projects could help absorb some of the increased supply now reaching the market, though overall the larger increases currently seem to be on the supply side rather than demand.